For this project, we assemble a new dataset consisting of more than 25,000 residential and business broadband plans from all OECD countries from 2007–2009. We explore three issues: the relationship between plan components—such as metering—and consumer prices, price changes over time, and how broadband prices vary across countries. 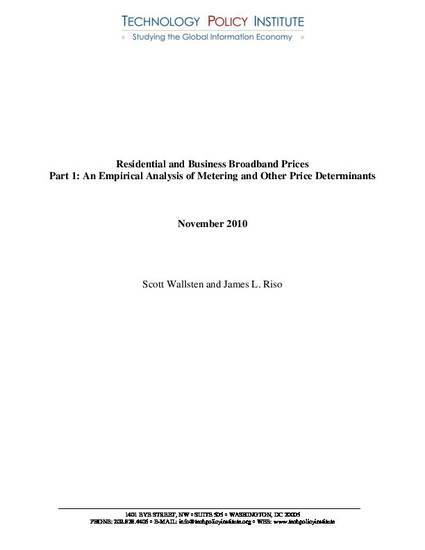 This paper, part 1 of the project, discusses pricing for broadband plans and, specifically, the relationship between plan components and pricing. We find that residential broadband plans with data caps—plans in which consumers pay a base price for a set amount of data—cost less than plans with unlimited data, other things being equal, for consumers who do not exceed the cap. The estimates suggest that a residential standalone plan with a 10 gigabyte (GB) cap, for example, would cost about 27 percent less than an otherwise identical, but unlimited plan. A residential triple play plan would cost about 14 percent less than an otherwise identical but unlimited plan. In the case of standalone broadband, each gigabyte of the cap is associated with an additional $1.67 per year; for triple play the premium is $1.85. In plans that include video packages, each channel is, on average, associated with a $2 price increase over the course of a year.